This is why I took the advice from a friend and ordered Police Procedural, A Writer's Guide To The Police and How They Work, by Russel Blintiff, and I am consulting with an officer friend. I DO NOT want my readers to know that all I know about cops is from Law & Order and CHiPs. I am anxious to get it right. The book is written, the story is there, I just wrote the small but necessary subplot involving the men in uniform knowing it would require some research, later. And later is NOW, because my book is here and I'm diving in. I and my misinformation don't belong in my novel. My hero belongs in my novel. Do you have any research stories? Have you ever set out to write about something you know little about? Ahh--CHiPs. I loved that show. And I need that book! Thanks for sharing. I've been consulting with some retired detectives and wondered about the involvement of some new technologies. How current is this book? Oh, heavens--if I wrote only what I knew about, I wouldn't have written most of my books. (Historical fiction = hello, research!) My last historical about killed me with all the horse research, since a horse is a main character (there were times I wanted to just torch the thing it got so frustrating). But then, my new contemporary book had its own brand of research. I love WD's How Dun It series! I own that book and several others! M, I have been tempted to try my hand at blurring reality. Haven't tried fantasy... yet! Kate, The book was written in 1993, so I bet a lot has opened up, technologically. 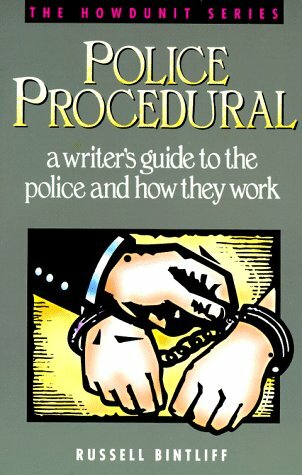 Still, it is a straight-forward, cut and dry approach to police work (in both urban and rural settings) and answered nearly every question I had (I just finished it, skipping the sections that didn't apply to my book). I will definitely use it as a future reference. I ordered a used copy through Amazon ($3.00) and it's actually a new book with a bit of folding along the cover's edge. Excellent information on the police detective, which is what I needed. 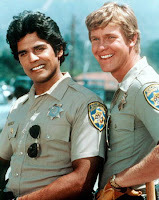 Just a note about CHiPs: My little brother and his friend used to play "Ponch and John" on their big wheels. I think they arrested me on my bike for speeding once. Annette, I know. You historical fiction writers have my complete respect. I have stories in my head that just might stay there because it would require delving into loads of history! And though it is easier to write what we know, every story I've written so far has some element that forces me to branch out, seek out, study further. My current WIP takes place in Ireland and has a Catholic priest. I took the initiative and interviewed our local Priest (small community he's actually on loan and comes down a couple times a week for services). So between the interview and the countless internet hours spent trying to get an accurate understand of Ireland and Catholicism, I am getting crazy eyes. I knew absolutely nothing about the Catholic religion before this (except the oh so accurate portrayals that Hollywood gives us). It was actually very fun to do the interview and it helped me have a greater appreciation for my own faith. My WIP is a historical fiction, though that was never the plan, that is where it has taken me. It is so interesting that despite how hard you try to "know" where your story is going, it always takes on a life of its own and as the lucky author you get to go along for the ride. Very smart and a great idea. I didn't even know there was a book like this available! Thank you for posting this. I stole your quote too! Love it!